1. What is right heart catheterization? The right heart catheterization is a method of haemodynamic exploration. The exam allows to establish with certainty and precision the existence of pulmonary hypertension, its degree and its accessibility to various treatments (medications, oxygen, etc.). It allows to assess the cardiac function. The test is carried out using a catheter (small flexible tube), called Swan-Ganz catheter, which allows precise measurements of pressures in some parts of the heart and cardiac output. By the measurement of cardiac output and capillary pressure blocked, this test assesses in detail the left functions and right functions of heart. 2. Which are the indications? The right heart catheterization is indicated in the assessment of congenital heart disease and disease reaching the heart muscle or heart valves. 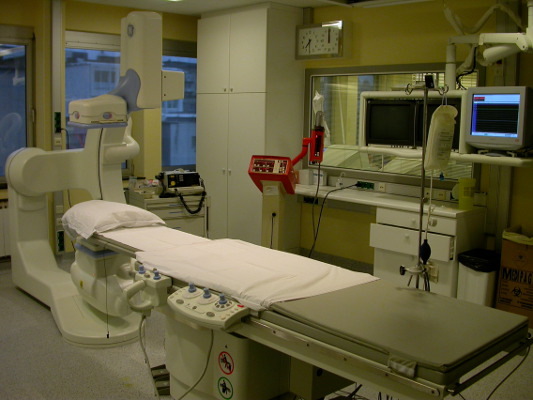 It is used to confirm the diagnosis of heart disease established by other non-invasive tests. This test is for example indicated for patients with pulmonary hypertension or heart failure. It can be stated in a preoperative assessment for cardiac surgery. The doctor has the results of routine tests (ECG, RX thorax taken blood ,...). It is not necessary to be so strict fasting. The area where the catheter must be inserted (the fold of the groin, neck) is shaved and washed with an antiseptic solution to prevent infection. The patient is then covered with a sterile field. The patient is lying on his back on the exam table. A continuous monitoring of the ECG is established. The doctor uses self-electrodes on the chest of the patient. Under local anesthesia, an introducer is introduced into the femoral vein. A catheter is introduced through the sheath, in the heart. The catheter is connected to a measuring device for recording a continuous and precise pressures obtained. It can also take samples for analysis of blood oxygen content of blood. Once the equipment is put in place, the measures can be carried out (pressure measurements and flow, oxygen consumption) in lying and standing position. The exam can also be made from a vein in the neck under local anesthesia. For the right heart Catheterization at rest, the exam ends at this level. For the right heart catheterization during effort, the exam continues on the bike where the same action is taken. The catheters will be removed and a compression bandage is applied for a few minutes on the puncture. The test takes between 30 and 60 minutes. It can be much longer if effects of certain drugs is studied, for example in severe pulmonary hypertension. The test is not painful (the only unpleasant part can be local anesthesia). In the vast majority of cases, the right heart catheterization goes smoothly. some patients, "most sensitive", can sometimes feel what doctors call a "malaise vagal" with sweating weakness, diffuse slowing of the heart rhythm or blood pressure drop. The trend is rapidly good with appropriate treatment.